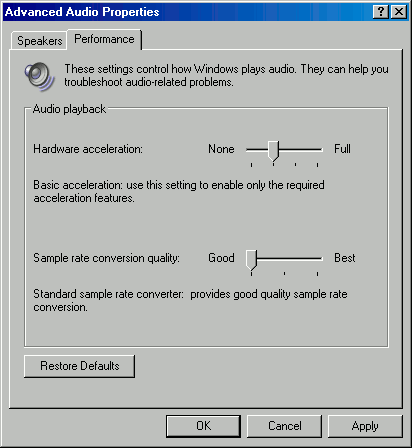 Because OrgMaker uses DirectSound, the Audio Performance settings in Windows affect the sounds OrgMaker makes. Open Sounds and Audio Devices. In the Sound playback section, click the Advanced button. Go to the Performance tab. After changing the Audio Performance settings, close and re-open OrgMaker for it to use the new settings. On my integrated sound card (SoundMAX), I noticed the following effects. On my add-in sound card (Aureal Vortex), I noticed similar results. Based on these results, I prefer to use OrgMaker with Basic hardware acceleration and Good (Standard) sample rate conversion quality.